To access our complete archive please join the International Leadership Association (ILA) today. In addition to our bi-monthly newsletter, you'll enjoy access to our Leadership Perspectives webinars (live and on-demand), conference discounts, and other valuable benefits. Welcome! 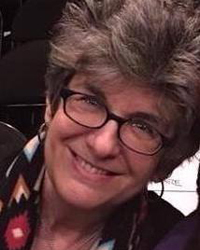 This issue of the Grassroots Leadership & the Arts for Social Change Corner features a column penned by Amy Horowitz. 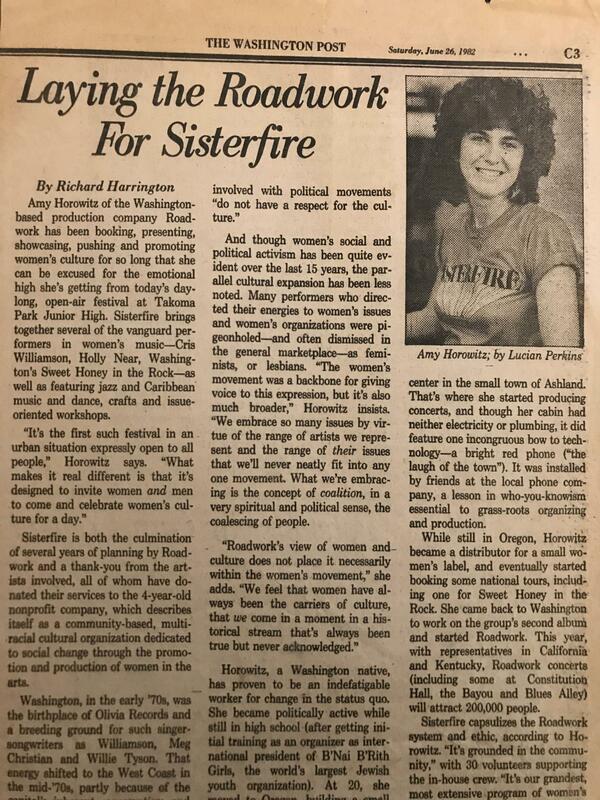 I formally met Amy on July 7, 2018 at the John F. Kennedy Center for the Performing Arts' Millennium Stage in Washington, D.C. She was at the venue to kick off the fortieth anniversary celebration of Roadwork and Sisterfire, which you’ll learn about below. 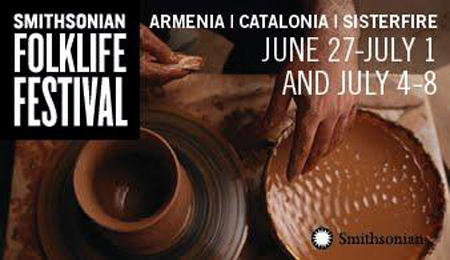 The event was part of the Smithsonian Folklife Festival. The purpose of the commemoration was to shine a light on the group that literally helped put women artists on the map in 1978. For readers not familiar with Roadwork, the D.C.-based multiracial coalition was a groundbreaking enterprise. Women leaders, involved in social movements in the 1960s and 1970s, came together through the arts to work for a more diverse, inclusive, and tolerant society. Their intersectional activism across gender, race, class, and sexual orientation galvanized thousands, helped break down barriers, and created lasting transformational change. Amy’s column is accompanied by an episode of Wasn’t That A Time that aired on March 8, 2019. The episode, that marked International Women’s Day, featured some of the troubadours of conscience on the Roadwork roster. “International Women’s Day is a time to reflect on progress made, to call for change and to celebrate acts of courage and determination by ordinary women who have played an extraordinary role in the history of their countries and communities” (http://www.un.org/en/events/womensday/). This month’s column celebrates the courageous leadership and coalition building of Sisterfire and Roadwork organizers. They were exemplary trailblazers, so we are dedicating this space to them. I hope readers and listeners are moved by Amy’s piece and the companion Wasn’t That A Time Tribute. It is an important glance into a moment in time that transposed history from the bottom up. Sisterfire 2018 on the National Mall. 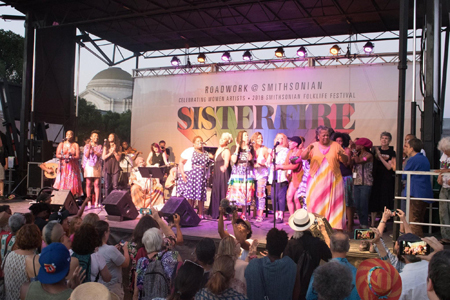 I have been asked to join you in virtual community to write about the Sisterfire celebration marking Roadwork's 40th anniversary that took place in July 2018 as part of the Smithsonian Folklife Festival. Since many may be new to Roadwork and Sisterfire, I see this audio/visual essay as a journey “There and Back Again,” to quote the title of a song composed by the 2018 Sisterfire curator, Toshi Reagon. In our real lives, time does not exist in chronologies — that is, we live simultaneously in past/present/future. 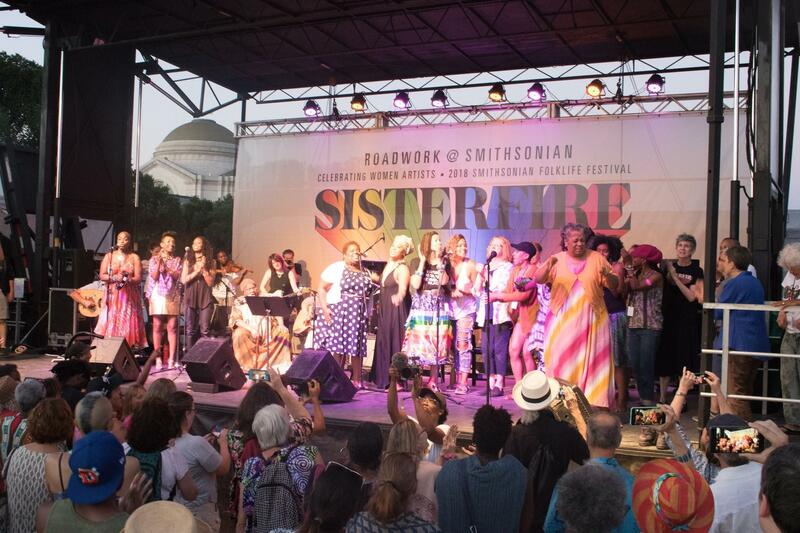 So, I’ll move between historical narratives, future aspirations, and the actual goings-on at the National Mall on July 8th at … whatever you want to call it: Sisterfire reunion, celebration, ritual of passage, revival, to be determined. In 1977, Roadwork was an idea brewing on the back porch of a Washington, D.C., row house. Many late nights were filled with heated discussion about what the organization would be. Was it possible to launch an organization based on the concept of coalition, of women working together, sharing power and responsibility across racial, cultural, and class lines to produce, promote, and discover women’s culture as it exists on a global level? The concept of coalition was not new; however, most coalitions were formed by a coming together of various organizations working around issues where a common thread could be found. There were very few models for an organization that was in itself a coalition. 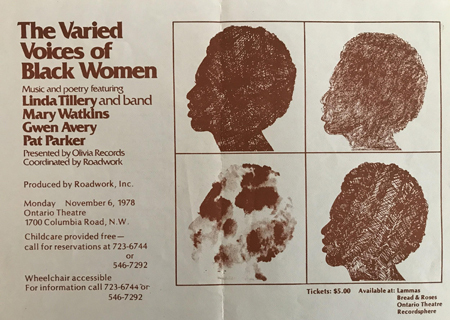 The name “Roadwork” expressed the vision that was developing: the work of building roads for women artists and the search for our historical links to women’s cultural contributions missing from history books and from White feminist herstories. SISTERFIRE was one of the clearest manifestations of the principles of Roadwork. The festival grew to be a concentrated celebration of the booking, production, and coalition work that we carried out year-round. I can remember the spring of 1982: The Roadwork house at 1475 Harvard Street NW was buzzing with activity. 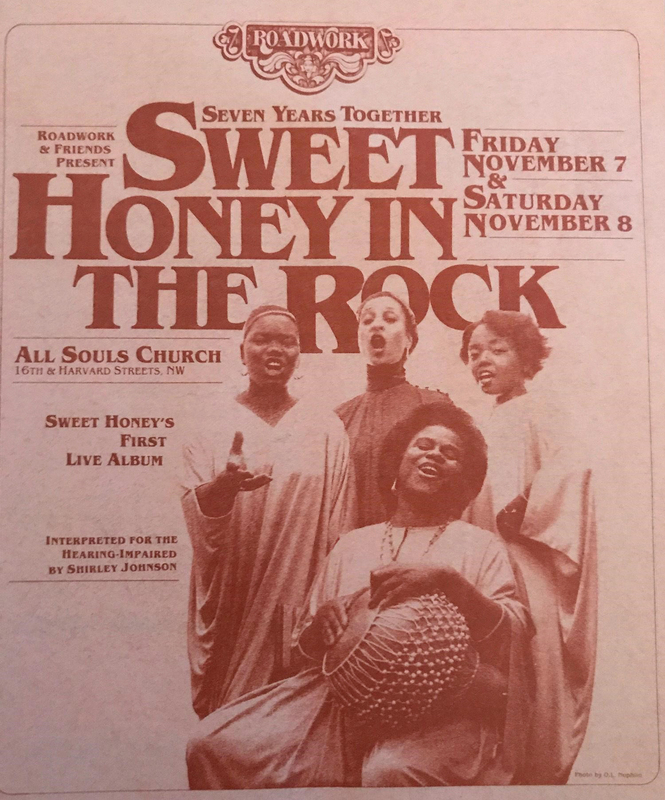 The phones were ringing off the hook with producers checking in on national tour dates for Sweet Honey In The Rock, Cris Williamson, June Jordan, June Millington. Our high school intern (also drummer, bass player, songwriter, singer), Toshi Reagon, ran across the street to the All Souls Church copying machine. The weary wheatpasting crew had worked late, hit The Florida Avenue Grill for breakfast, and was still at work plastering the city with posters — in the 1980s we publicized events by pasting posters on actual walls instead of posting virtually on social media. The Roadwork house was especially teeming with folks as we were about to produce a one-day fundraising event to offset the traumatic cuts to grassroots arts that were crushing us as Ronald Reagan’s policies took hold. “Sisterfire” was the name that emerged as board members and staff sat around the dining room table at Bernice Johnson Reagon’s Kennedy Street home. In addition to the Roadwork staff, Sistersparks — volunteers and tenants who traded hours for low rent while attending law school or working at progressive local organizations — filled the house. The backbone and heart of the forthcoming fundraiser, Sistersparks were people who resonated with the inclusive, urban, multiracial mission of the Festival. Sweet Honey In The Rock, Holly Near, Cris Williamson, Alexis De Veaux, Michelle Parkerson, Women of the Calabash, and The Harp Band had volunteered to perform. 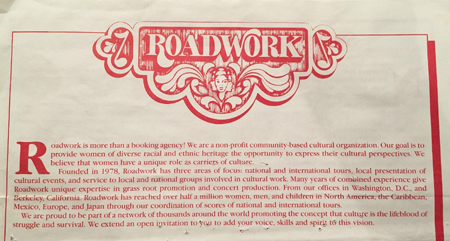 Founded in 1978 by Bernice Johnson Reagon and me, Roadwork, Inc. was created to “put women’s culture on the road” through tours, festivals, concerts, and workshops. This was a time, not unlike today, when activist-artists engaged in urgent responses to violations of human rights in Latin America and in Wilmington, North Carolina, the AIDS epidemic, nuclear madness, racism, and the ongoing war against women. In the cauldron of local, national, international, multi-racial, cross-cultural issues, Roadwork wove together a coalition effort based on artistic collaboration among diverse communities. We saw ourselves as the children of the Black southern civil rights and the labor movements, and we were determined to be a visible force in the emerging women’s and lesbian/gay rights movements, both of which were too often dismissed as irrelevant to larger social justice concerns. 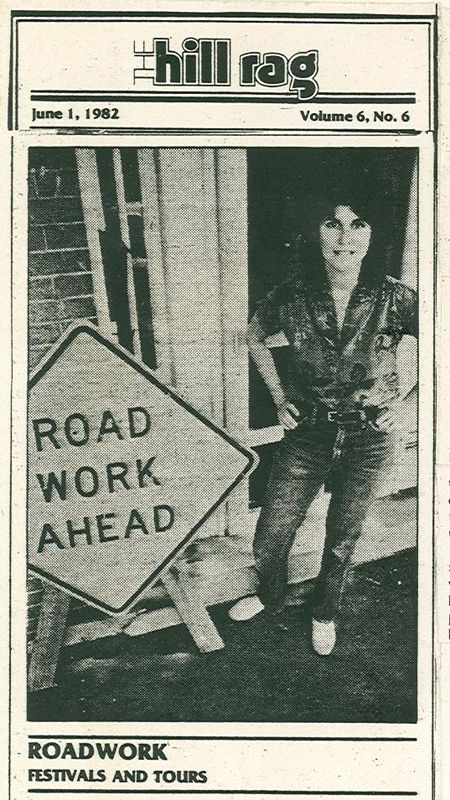 Roadwork was born in a context of profound sexism. Misogyny in the music and entertainment industries severely limited women, especially women of color promoters, recording engineers, and independent artists. Despite these obstacles, an underground women’s culture of poets, visual artists, filmmakers, and musicians flourished from the 1970s into the 1990s, finding voice in coffeehouses, independently produced concerts, festivals, and protest rallies. Women and feminist men formed record labels, organizations, and networks like Olivia Records, Redwood Records, the Women’s Music Distribution Network, Seattle’s Riot Grrl movement and grunge scene, and Boston’s Rock Against Sexism. Underground festivals were born such as the Michigan Womyn’s Music Festival, the West Coast Women’s Music and Comedy Festival, the New England Women’s Musical Retreat, and Roadwork’s own Sisterfire Festival. Independent producers and distributors built alternative economic models that challenged the mainstream music business. Roadwork emerged at a time when the United States was engaged in widespread covert intelligence operations both domestically (in opposition to civil rights and anti-war movements) and globally (in places like El Salvador, Nicaragua, Honduras, Chile, and countries in the Middle East). Anita Bryant was campaigning against lesbian and gay rights across the country (1977-1980s); Jerry Falwell and the self-proclaimed Moral Majority were attacking women’s rights, abortion access, and gay rights; California voters were facing a ballot initiative that would have banned openly gay people from teaching in schools (1978); and a conservative Supreme Court was rolling back civil rights gains. The idea that culture could be a strategy of resistance lay at the heart of Roadwork’s mission. Through concerts that brought activists and artists into collaboration, Roadwork inspired tens of thousands of people to generate social change in reactionary times. Roadwork trained a generation of organizers, producers, and women leaders to recognize that domestic politics in the United States are integrally tied to struggles for justice globally. Roadwork mobilized diverse audiences and built lasting coalitions across the lines of race, gender, sexual orientation, and economic class. 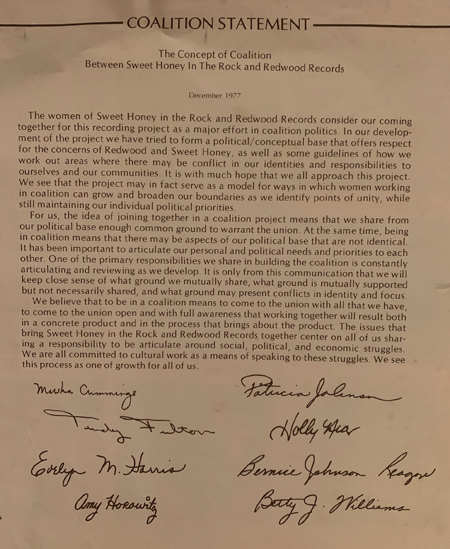 Roadwork’s guiding principles, articles of incorporation, and by-laws derived from a Coalition Statement that Dr. Reagon and I wrote in 1977 to serve as the principles of engagement for a recording project between Holly Near’s White-women-run company, Redwood Records, and the Black women singers of Sweet Honey In The Rock. The recording project and a West Coast tour that I booked with Holly’s support laid the groundwork, or Roadwork, for the organizational principles that we developed in D.C.
By August 1978, Konda Mason had joined me on the back porch and together we booked Sweet Honey In The Rock, The Varied Voices of Black Women, June Jordan, Holly Near, Alive, and the Wallflower Order Dance Collective in addition to producing concerts, including the first annual Sweet Honey In The Rock anniversary concert (their sixth anniversary). Over the next twenty years, we produced a dizzying number of local concerts and national/global tours for over thirty women artists and groups. We were activists in our twenties and early thirties, and we were making the organization up as we went along. On the one hand was our concrete work of booking tours and producing concerts, while on the other hand was our work with organizations throughout the United States and globally in how to work across difference — even as we tried to do so ourselves — and providing support for organizers of D.C.-based marches. We were trying to build a multiracial coalition structure. For a leadership model, we sought guidance from Roadwork co-founder Bernice Johnson Reagon’s work in the southern Black civil rights movement as singer, activist, and organizer and we sought lessons from our own work in anti-war collectives, women’s health centers, and women’s and gay rights movements. We were aligned with the developing network of mainly White, lesbian women’s music producers, distributors, bookstores, and festivals. We were also aligned with Black church, festival and feminist groups and together we were building an alternative music network. At the same time, we were also intent on overturning the music industry, invading it, and taking it over. We saw ourselves as grassroots movement builders, infiltrators and rabble rousers. In fact, we were allergic to the idea of leadership. The leadership models we observed in corporate, government, and progressive left circles fell short. In policies and practices, sexism, classism, homophobia, and racism were rampant. This allergy to leadership was a point of pride at the time; now it prompts critical reflection. We also resisted the (mis)leading notion that building an organization is the work of one person or a small handful of people. This is rarely the case. The story that often remains untold is of the many people and the hundreds of thousands of hours that go into creating and sustaining a vision. 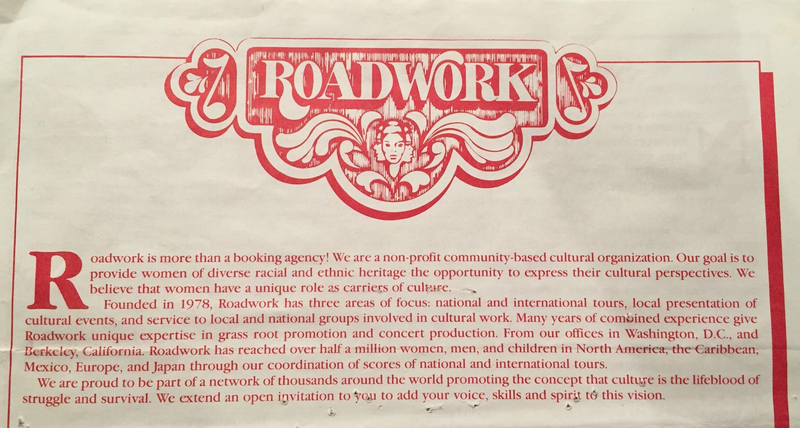 We chose the name Roadwork because we felt that in order to put radical, and primarily women of color artists on the road we would have to build the roads. We liberated an orange and black Roadwork sign from a nearby construction site and placed it on the front porch, a defiant symbol of the Roadwork ahead. This next song, the words, were written by Assata Shakur. She says, “Everything we see, we have seen before.” I mean, you can go around and be shocked about being in Washington, D.C., and be shocked about Yulanda Ward being killed, about sixteen children killed in Atlanta, and be shocked about the Klan gunning people down …. But this poem says, we know about this, and there’s something we have to do, because we do know what it means for us. First, we’ve got to take what we know very seriously. It can get you killed, as we have seen. And the things we sing about, some of them are building things so that we stay together as human beings, other things are really about what we see happening to ourselves and to our community, and Black people in this country, and human beings in this country, and you know Reagan’s been here before to Washington. You don’t just live through it! You don’t just coast through this decade! You don’t get to sleep through! (Applause). 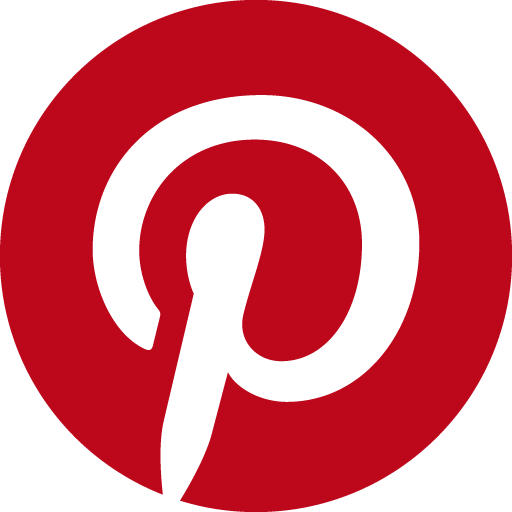 If you are still here in 1990 and in the year 2000, it is going to be because you have been visible…. It is very important that all of us find some place to be and to organize with people who sort of have the same issues you have, so one day, if you disappear, someone will miss you if you’re gone. (Applause). It is very much open season for Black people in this country. We can’t just read about it, and about the FBI sent down to Atlanta to look for those children. There was a time when they lynched Black men in this country, and when you get them sort of young it does something to you, or it should. So, we hope that this gathering tonight is some kind of coming together. We sing about a lot of things because we feel a lot of things. And there we were at Roadwork … a small cohort of primarily women-loving-women learning how to work together even as we built the physical concert and festival stages, came together across difference, gathered across asymmetrical relationship to one another. There we were moving against homophobia in the left and in communities of faith, fighting racism in the White women’s movement, challenging women’s exclusion in the music industry, fighting the AIDS epidemic, and standing against the massacre of Palestinians in Sabra and Shatila refugee camps. On the one hand, we assumed that our shared sexual orientation made it all okay. But it was not okay. Issues of racism, classism, ableism, anti-Semitism, Islamophobia threatened to drown out the applause in All Souls Church. We hurt each other constantly; we did not know everything we needed to know either about ourselves or about each other, and racism was not just “out there” but in the White women in Roadwork. We were a coalition of learners. As Bernice Johnson Reagon later went on to write, coalition is by definition uncomfortable because it presupposes meeting across difference. That’s why it is called coalition and not home. It is not easy to build a coalition because although we “share” experiences of hurt, pain, anger, disappointment, and transgression, we often do not recognize the hurt in others. Forming coalition with others implies seeking common ground while identifying issues of divergence and disagreement. These are what I have described in previous writings as “disputed territories” in both geopolitical and internal locations, that coexist within each of us. We each bring multiple identities and disputed inner territories to the coalition table. Being in coalition means that we need tools to survive the hurt we cause each other and ourselves. Dr. Reagon keenly observed that coalition means getting comfortable with the discomfort of disagreement and fighting against being surprised and disappointed in one another when the thorny stuff pricks us, whether it is the racism of White women, divergent political positions on Palestine, asymmetries of class, education gaps and class, and generational divides. In summer of 1981, Dr. Reagon arrived at the West Coast Women’s Music and Comedy Festival and took the stage shortly after an explosive incident. She delivered a stirring, improvised oratory on coalition that formed the basis of her canonical essay, Coalition Politics: Turning the Century, originally published by Kitchen Table: Women of Color Press, which was founded by Barbara Smith (who also co-founded the Combahee River Collective). As Bernice often said: “If you are feeling comfortable, you are not in coalition.” Her essay drew upon the West Coast Women’s Festival incident, but in broader strokes, her understanding of coalition came from growing up Black in Albany, Georgia; organizing in the Student Nonviolent Coordinating Committee; demonstrating at Albany State and studying at Spelman; negotiating across difference at the Smithsonian; and working in The DC Black Repertory Theatre, Sweet Honey In The Rock, and Roadwork. For the fledgling group at Roadwork, Reagon’s thinking on coalition provided a backbone and a cautionary tale. Being in coalition didn’t mean becoming best friends. On the one hand, Roadwork tried to operate as a tight-knit family — a brigade of wheatpasting freedom fighters that sought nothing less than the transformation of society. But what about self-transformation? The Roadwork coalition became an unsafe environment when we placed ourselves and our institutional structure above and outside the issues we were fighting externally. In this way the “personal is political” became a lip-service phrase rather than a clarion call and created a collision of intention and unrealistic expectation. Coalition is best approached as a place to do some good work with others with whom you may not completely agree. It is not a place to find an intimate friend circle where the expectation is deep resonance. It’s complex. We argue with our friends and we argue in coalition — but the terms of engagement are different. These realizations would later inform my academic work on disputed territory, the Israel-Palestine conflict, the asymmetries between European and Mizrahi Jews. What I began to see through Roadwork was that coming together and sharing music across difference did not erase difference or create symmetry out of asymmetry. In fact, the expectation that a shared moment on stage, or in an all-night wheatpasting foray, would erase difference is romantic and problematic. In fact, shared experience can mask issues of racism, homophobia, sexism, and class — creating an illusion that in the euphoria of communal harmony the issues are resolved. I began to ask whether collective encounters across difference are a dress rehearsal for overcoming asymmetry or something that masks the asymmetry? This is not to say that shared moments are illegitimate, but there should be no illusion that a song will bring peace. Looking back, I see how we stumbled over the asymmetries of our diversity: race, class, religion, gender, sexual orientation, urban/rural, north/south, east/west. We were busy trying to create a suitable location in the house for a reporter from none other than The Washington Post to interview us about Sisterfire. Furniture was sparse, though more plentiful than in 1979 when Smithsonian Festival co-founder Ralph Rinzler visited and sat on a floor pillow in his suit and tie. Fortunately, the reporter was Richard Harrington, who had previously written for the underground papers. Seeing ourselves in print in The Washington Post and, more importantly, the success of our first Sisterfire were organization-shifters for Roadwork. We created a Board of Directors — not just names for the IRS, but people who met and figured out a way forward. 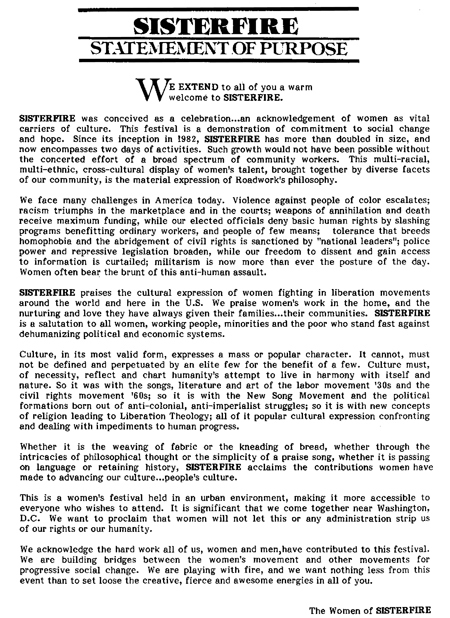 We gained more visibility, DC Arts Commission and Humanities Council awarded us grants, and Mayor Marion Barry proclaimed June 26, 1982 Sisterfire Day. Volunteers offered legal, graphic, and accounting expertise. We created committees for fundraising, artist friends, and direct mail. Grants came in from the National Endowment for the Arts and the United States Information Agency. 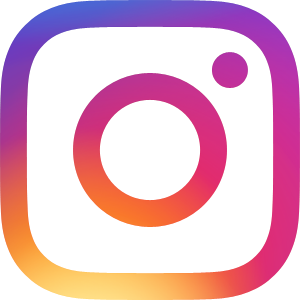 Sisterfire grew, from a one-day event in a Takoma Park field to two days with three stages at the Upper Marlboro Equestrian Center. Sisterfire presented Alice Walker, Tracy Chapman, Hazel Dickens, Elizabeth Cotten, and Ronnie Gilbert. Alicia Partnoy, Moving Star Hall Singers, Hala Deeb Jabour, and Sara Alexander shared stages with Sweet Honey, Holly Near, Cris Williamson and Alix Dobkin. And the audiences, marketplace vendors, and volunteers reflected this diversity. And then in 1987, a controversial incident changed everything. 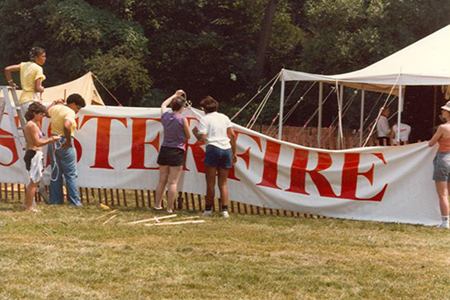 It is not surprising that the explosion that put Sisterfire into a twenty-year hibernation was a conflict in the marketplace between two White lesbian separatist vendors and two Black gay male Sisterspark volunteers. Much has been written about the volatility of gender and race in the marketplace. Still it was difficult to remain academic during the explosion. When gay Black men/Sisterspark volunteers saw that a White woman-only space had been created in the marketplace, they reiterated the Festival policy, that all spaces were open to all people. A confrontation ensued and we asked all four to leave the festival, but the outcry from White lesbian separatists (see their opinion piece and our response in the October, 1987 issue of off our backs) resulted in reduced attendance in 1988 and 1989. 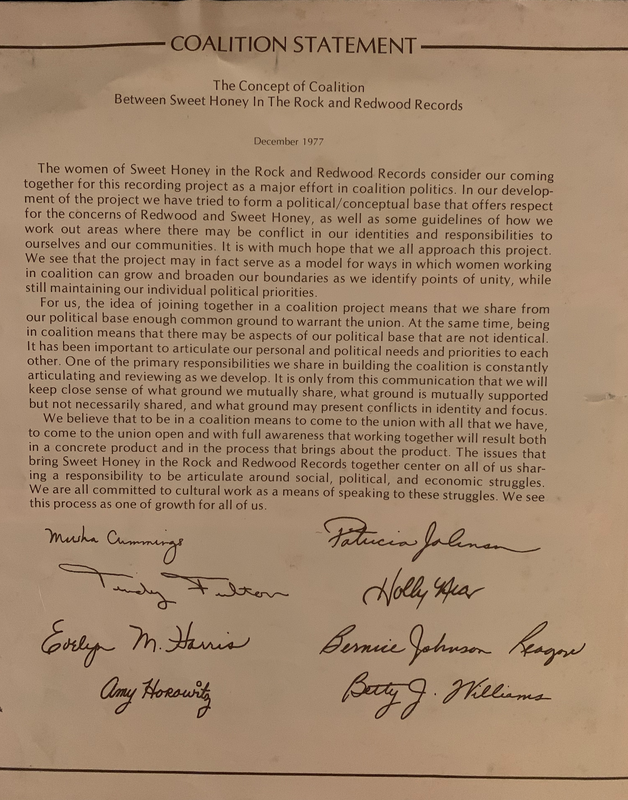 In 1989, Dr. Reagon invited me to write a chapter about my work with Sweet Honey and Roadwork for her edited book, We Who Believe in Freedom, Sweet Honey in the Rock...Still on the Journey. When I turned it in, she noted that I had left out Sisterfire and helped me craft a way to write about the end of the festival. We came up with the idea that Sisterfire was hibernating. “I like to think that Sisterfire is sleeping, in hibernation, gathering new strength and insights from the efforts of the first years. I like to think that she will wake up renewed again … soon” (p. 194). And hibernate Sisterfire did. Or so we thought! Turns out that Sisterfire showed up at the Apollo Theater in 2015 when Toshi Reagon connected the young women producers of the Women of the World Festival with our work in D.C. In a story about the festival, Newsweek described Toshi as “a veteran of several female-focused festivals, including Sisterfire in the 1980s.” And at Spelman College in Atlanta, it turned out, “SisterFire” is an open mic that encourages expression of all kinds, catering to women-identified, gender-nonconforming, and queer people. Roadwork’s newest board member, Nicole Barden, attended the 2018 reunion at the Smithsonian thinking that it was in some way connected to her alma mater, and that was when she discovered the ancestry of Spelman’s SisterFire. I share these stories of other Sisterfire sightings because they are evidence of how important it is to “leave a trail” as Dr. Reagon encouraged us to. Leaving a trail is not for nostalgia but because there is something of value to pass on in the work that we did, in the successes that we celebrated, and in the mistakes that we made. As Paulo Freire writes in Pedagogy of the Oppressed: “Hopelessness is a form of silence, of denying the world and fleeing from it” (p. 91). Writing the Sisterfire section in the Sweet Honey anthology was a way of working against flight and denial. I took these lessons into my doctoral studies, where I put them to work in writing about Arab Jews in Israel and the discrimination Mizrahim experience. In the course of my studies, my Roadwork experience in building multiracial coalitions led to my understanding that disputed territories are more than geographical locations. Looking back on the idealism of our coalition statement, I questioned the simplified premise of an equal playing field, what Freire called “a horizontal relationship in which mutual trust between the dialoguers is the logical consequence” (p. 91). In what way could we have more directly articulated the unequal experiences that we embodied? As I researched Arab and European Israeli Jewish music, the unequal playing field became obvious. I wondered how it must have felt for women of color to enter into an idealistic paradigm that did not account for the White racist foundations of the society embedded in our own alternative experiment. Are the lessons learned from this courageous orchestra or during our multiracial coalition of the 1970s-1990s instructive in light of current attempts at coalition, say, in understanding the explosive issues that rocked the Women’s March as women of color and Jewish women with white-skin privilege wrestled across race, White supremacy, Islamophobia and anti-Semitism? What will it take to build and sustain coalitions that can overtake the "deep history" of racial and economic injustice, greed, and hurt? Truthsayers like Nancy MacLean, who wrote Democracy in Chains: The Deep History of the Radical Right's Stealth Plan for America, remind us of the enormity of our task and the insidiousness of the 1% that rules and divides us. How did "Leaving a Trail" Lead Us to the National Mall? How is it that Sisterfire, a festival initiated as a fundraiser in 1982 to offset Ronald Reagan’s devastating cuts to grassroots arts, was transported from a modest field at Takoma Park Middle School to the National Mall in 2018? Dr. Reagon first posed the challenge that led to the reunion a decade ago. She said, “You’ve got to leave a trail about what Roadwork did — what we did, so that people can stumble across it.” I think she meant a short essay! Five years later Urvashi Vaid posed a similar challenge and “the trail” evolved into an oral history and documentary project. When our documentary director, Dr. Yvonne Welbon, considered joining the effort, her first thought was: “What about producing a reunion concert?” So we gathered, wondering if the story of a multiracial coalition that put women’s culture on the road in the 20th century might have lessons for the 21st. 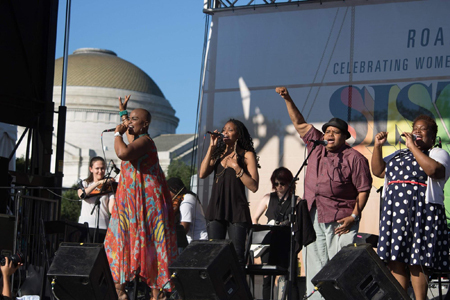 Performing at the Smithsonian Folklife Festival seemed like a long shot, though it was historically fitting. In 1973, festival co-founder Ralph Rinzler invited Dr. Reagon to co-curate the festival’s African Diaspora Program (1974-76). She went on to become the creator and director of the Smithsonian’s Program in Black American Culture (1977-1994). In 1979, Rinzler had saved Roadwork from eviction by purchasing our rented row house on Harvard Street, in 1983 he funded a live recording of Sisterfire performers that was released by Redwood Records. 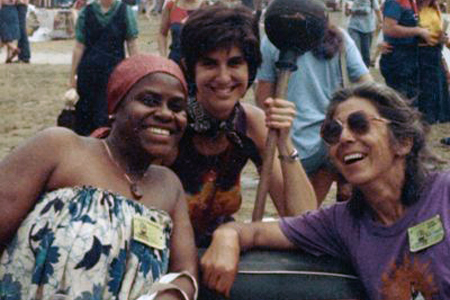 In the 1990s I served as a festival curator and Acting and Assistant Director of Smithsonian Folkways. And before all this, in 1965, a twenty-three-year-old Bernice Reagon had recorded on Folkways. Toshi Reagon, curator of this artistic Sisterfire reunion vision, embraced the Roadwork legacy and its potential resonance for younger artist-activists who may have never heard of the organization before. Their introduction to Sisterfire would be the rebirth of the experience itself. She wove a narrative that moved us beyond the traditional concert or festival format to an arts-based call to action — a round robin of intentionality. Fierce volunteers showed up like they always had, lawyers, activists, producers, and artist hospitality folks. Some were elders and had trained at Roadwork, and some were experiencing Roadwork for the first time. The sun is setting behind the Washington Monument as the two-day reunion draws to a close. All the artists, organizers, and participants are standing in congregation. Tonight, full-voiced, we sing together across race, generation, issue, ability, gender, religion, and sexual orientation. 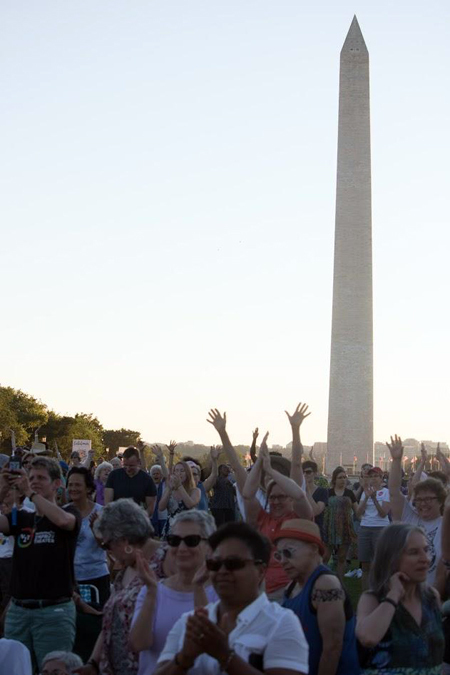 The songs fill our bodies, fill the National Mall and give us a beacon to a land that does not yet exist. The closing song at the festival is Come and Go With Me to This Land. Listen to it here from Reagon’s 1965 Folkways LP. I imagine where the 20-40-something artist-activists will take this experience as they join together with artists in their fifties, sixties, and seventies. 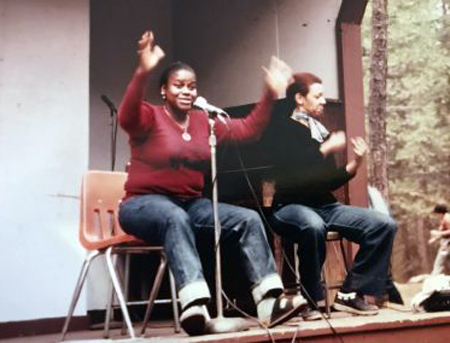 Together they co-create and share a 2018 Sisterfire stage much as Toshi did with Elizabeth Cotten in 1983, like Moving Star Hall Singers co-created with Casselberry and Dupree in 1984, like June Jordan co-created with Tracy Chapman in 1987. I am thinking of the Sisterfire ancestors, Odetta, Ronnie Gilbert, Ampara Ochoa, June Jordan, Shirley Childress Johnson, Flora Molton, Elizabeth Cotten. It is not nostalgia — it is radical reverie. What we saw as an ephemeral reunion to capture some footage for the oral history project has become, instead, a rebirth, and in this way Sisterfire lived up to her name and sparked herself out of hibernation and into service going forward. Roadwork has established a new and younger board leadership conjoined with elders from back in the day to rekindle aspects of Roadwork’s mission that are relevant for these times. We realize that a multiracial coalition that centers women’s culture in the service of justice is still relevant. Through the new leadership, Sisterfire Roadwork@40 and future projects do more than “leave a trail” for future generations of activists and artists — they are continuing the work of building new roads. Acknowledgements: This essay benefits from an essay co-authored with Urvashi Vaid, Roadwork Board member and inspiration behind the Oral History Project and from Jessie Washington, current Roadwork Board Chair. Horowitz, A. (1994). Israeli Mediterranean Music: Cultural Boundaries and Disputed Territories (Unpublished doctoral dissertation). University of Pennsylvania, Philadelphia, PA.
Horowitz, A. (2016). Next Year in Washington: The Jerusalem Program - Postponement and Rebirth. In O. Cadaval, S. Kim, & D. Baird N'Diaye, Curatorial Conversations: Cultural Representation and the Smithsonian Folklife Festival. Jackson, MS: University of Mississippi Press.